Alma Books distinguished themselves for me by publishing Tom McCarthy's quite brilliant Remainder back in 2006 after its small initial print run under Metronome Press, Paris. As they point out on their website 'alma' is Spanish for soul and they regard the book as an 'aesthetic artefact'. With this focus on quality their books always have that gratifying feel in your hand; a genuine hard back, quality paper and a satisfying spine. 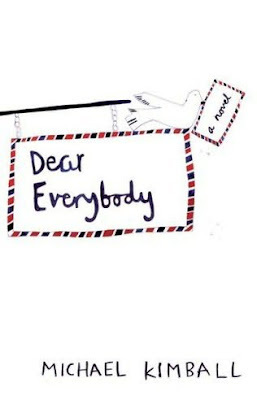 That idea of the book being an artefact makes them the perfect publisher for Kimball's epistolary novel, Dear Everybody , which comes in the form of letters, diary entries, newspaper articles and 'Other Fragments, Which Taken Together Tell the Story of the Short Life of Jonathan Bender, Weatherman'. Before it even begins we have the newspaper report of Jonathan's suicide and a note from his brother Robert who begins by saying that he never liked his brother growing up but hints that acting as a kind of literary executor has opened his eyes to the childhood they shared. After Jonathan's opening letter in which he explains that 'Everything that I can remember is falling out of my head, going down my arm, and out my fingers', the documents are presented in chronological order from 1966-1999, mostly two to a page but every now and then a single letter is surrounded by the white space of the page around it, concentrating the eye on the fragments of meaning that might be contained is these sometimes mundane utterances. The early pieces especially have the simplistic outlook of the child, a boy who pulls the feathers from his pillow because he thought he might find a bird, and who now writes to the Easter Bunny to explain his confusion at not finding eggs in his garden like all the other kids. As the letters grow in number Kimball is able to build a subtle portrayal of a childhood lacking companionship, family stability and coherence. Jonathan has an almost autistic understanding of the world and whilst some of these early confusions are a little too cute, there are moments of genuine humour. I wore that crown from Burger King for most of the summer of 1975 because I really thought that I was the Burger King. It couldn't have been anybody else. Nobody else was wearing a crown. The reason I took your astronomy class...was because I wanted to be able to stand outside at night with a girl and tell her about the sky. I wanted to be able to describe the dread and the wonder that puts me in awe of my existence. And I wanted her to associate that feeling of awe with me. You might try it. It worked with Lisa Wilcox. Through their repetition into his teenage years and adulthood, and the shift in tone we see the impact of abuse on his personality and the beginnings of mental illness. His relationship with his father is particularly fraught. We know from the diary entries of his mother (which lend the novel and immediacy closer to a normal narrative) the problems within their marriage and family life and through the present day conversations between his father and brother we hear from the horses mouth about his inability to cope with a child he never wanted and couldn't connect with. It is Jonathan who finds the best way of describing their relationship. I still remember those few times that we played catch together. I used to think that throwing the baseball back and forth somehow connected us. But now I realize that neither of us held onto the baseball for very long. It was mostly something in the air between us. Jonathan's simple view of things allows the reader to fill in the gaps and articulate what he cannot. It is often what isn't said that carries the impact and nowhere is this more obvious than in what we infer about the childhood of his brother Robert. His outright denial of abuse (including a passage dramatically censored from one of Jonathan's letters) is slowly chipped away and the conversations with his father dissolve into silence. It is left for us to decide what the truth may be. With all of these separate voices and documents there is a great sense of loneliness throughout the novel. The characters almost demand that we connect with them and with such a stylised format and the fine line between sentimentality and empathy being constantly ridden, how successfully this works may well end up being a matter of personal taste. But the format actually seems to me to be the perfect way to tell the story of a man who has fallen through the net and remembering that he has taken his own life gives a forensic importance to the documents. As you go through the evidence you may find yourself caring more with each page not only about his sad, short life but the continuing narrative of those other voices around him.